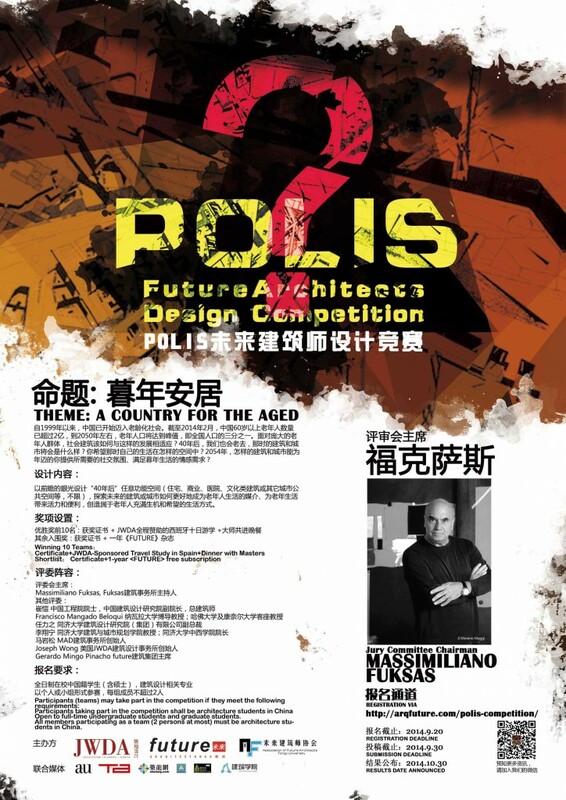 POLIS future architectural design competition is a feast prepared for students who enjoy architecture and devote themselves to architectural design. With your understanding of the society, how could be Polis described? With your wisdom and design inspiration, the future could be understood; With your strength and effort, to be a real independent architect is no longer a dream. We encourage you, To talk with masters to gain lots of leading design inspiration; We encourage you, To experience the design philosophy when traveling around Spain; We ensure you, A dream-realizing opportunity which could change your future. COME ON, LETS THINK ABOUT TOMORROW! POLIS future architectural design competition, which is sponsored by JWDA, co-hosted by JWDA, FUTURE and AF, is looking for talented students to offer fresh, creative, unexpected design for what urban environment should be in future. How must a city face the threats of worsened climate, disparity of wealth and other social problems and challenges? It is exactly the motive of holding the contest. The participants are encouraged to describe a livable POLIS influenced by regional, economic, environmental, cultural factors in an innovative and creative way. Description: Since 1999, China has stepped into an aging society. Up to Feb. 2014, people over 60 have reached 200 million. However, this population is unstoppably expanding. It is estimated that the one-third population of China will be the aged around 2050. How could social architecture adapt to such rapid aging development? 40 years later, we will inevitably join the “expanding aged team”. What the architecture and city could be at that time? What kind of urban space you would like to live in? What kind of city and architecture could meet your social and emotional needs? Requirements: Any future architecture or urban space could be designed functionally to explore how architecture or urban could serve the aged better, provide them a convenient, active and hopeful lifestyle. There is no limit in form. Any residential, hospital, commercial, cultural building, urban space or other form is acceptable. Participants can choose the site. The design should be challenging, practical and feasible. The competition contributions must be submitted in English and in Chinese; the unit of measurement is metric scale. * Open to full-time undergraduate students and graduate students in China. * All members participating as a team must be 2 people at most). The 10 awarded participants will receive a certificate and as award, an architecture journey to Spain in Januay 2015 before Chinese new year and dinner with Master architects. The awarded students will have to complete a TRAVEL NOTEBOOK comprising of texts, drawings, photos, collage,… of the different cities. This TRAVEL NOTEBOOK will be submitted individually to JWDA once they return to China. Finalists will receive a certificate, and 1-year free subscription of future magazine (Chinese edition). A. A national Chinese jury, before October 6, 2014, will examine all the entries submitted. A maximum 20 proposals will be shortlisted. B. The final international jury will meet in Shanghai in 20 October 2014 and will examine all the entries shortlisted by the national jury to choose the winning. 10 winners will be selected out of 20. The winners will be announced in an event organized during the afternoon of October 30, 2014. Previously there will be lecture of the jury members. The competition contributions must be submitted in English and in Chinese. It is required to REGISTER to enter the competition. Entrants may either make a submission individually or as a team (2 people at most). Participants must send an email to communication@arqfuture.com address with the following data: Name, Surname, Citizenship, Birthplace, Birth date, Email, Telephone number, Address and Information of belonging to any Chinese University. After your registration FUTURE will provide a confirmation email and a 5 digit code which must be included on all entry panels. *AF with the code: FutureArchitecture. All the information about the competition will be published in these platforms. * 2 vertical A1 format panels in Portable Document Format (PDF) below 6MB each. * The names of the participants MUST NOT appear on the boards. Only the 5-digit code provided to each entrant by email should appear on the right. * Once the boards are sent additional edits, uploads, or changes CANNOT be made. * Once are sent by email, each participant will receive a confirmation email. * Winning projects will be required to submit original files/images for use in competition publications and exhibit materials. GMT+8, 2019-4-20 20:19 , Processed in 0.192791 second(s), 31 queries .